This beat is located below Gaulfossen and is an especially good spot during the early weeks. Generally, this pool is divided into two parts: the upper part which is made up of a deep channel running close to our bank; and the lower part, which widens out. 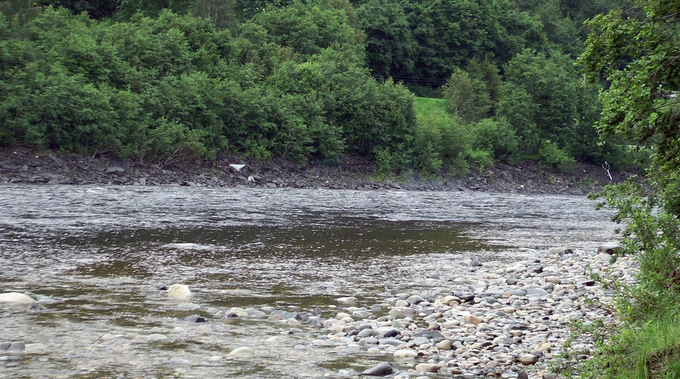 The main pool of the lower section begins to fish well in the middle of the stretch where the main current moves over to the other side of the river. There are a good number of large rocks in this lower section, and this is always a hot spot to intercept fresh fishing running towards the Gaulfoss. One can fish the upper channel in extremely high water. It is quite deep, and one need not cast far, just far enough to cover channel. Fish this part from the upper border down to the middle part of the stretch, until the main current of the river moves towards the middle and opposite bank of the river. Fish this part with quite heavy sinking lines and let the fly swing into the bank – sometimes fish take very close. 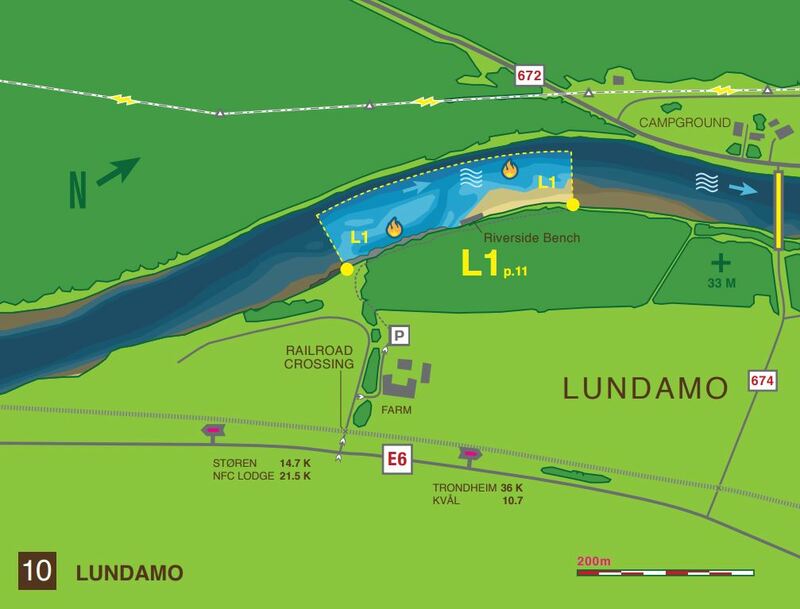 Make sure not to walk up alongside the bank of the upper channel, as one can scare the fish which may be very close to the bank! The lower section, below the shelter (picnic area) fishes well in all water heights. In high water one needs to be careful wading as the current is strong. The water looks faster than it is, but it is a strong current and you should watch your step. The lower boarder is marked by a red stone at the waters edge (not visible in high water- but there is a break in the trees with a marker). Please respect the lower boarder, and the fishermen of the beat below. Make sure to stop fishing before crossing into their beat. In high water use big flies, such as big Green Highlanders, Temple Dogs, etc. Even if the beat may be quite for a period, groups of fresh running fish can materialize at any time and suddenly one can hook a fish. After hooking a fish or catching (and hopefully releasing) the first fish make sure you quickly get the fly back into the water! 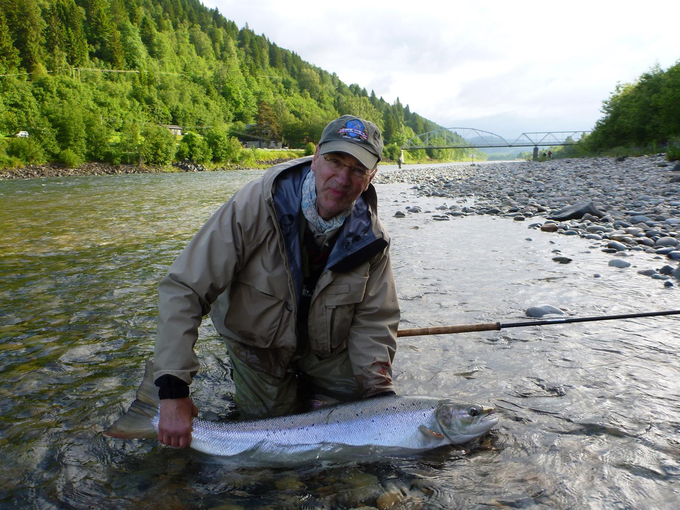 Salmon run in groups and often you are able to get the next hook up very soon! Fishing concentrates just on the lower part the main pool. The channel does not fish in those levels. Still the best area is above the lower border. Floating lines with sink-tip or intermediate lines are a good choice, full floaters in very low water with a weighted fly work too. 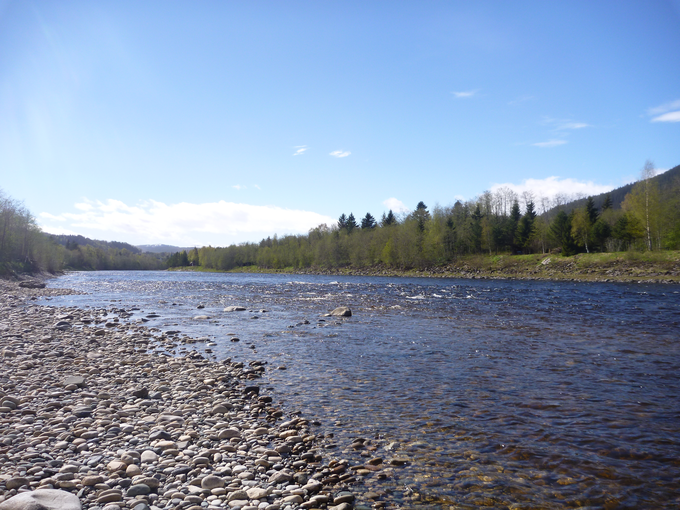 In general, in the lower Gaula you use bigger flies than above Gaulfossen, so do not use too small of a fly even though it’s warmer and the water is low. Drop in just above the shelter and wade out as far as you feel safe and fish the pool to the lower border several times with different methods and flies. Watch the lower fisheries: if they hook fish or you see fish showing, get in the water as a new group of fish will most likely enter the pool!